Should You Add a Barn Door During Your Home Remodel? > Whole Home Remodeling > Should You Add a Barn Door During Your Home Remodel? The “barn door” use to be closely associated with rural country living and the smell of hay trodden under hooves. 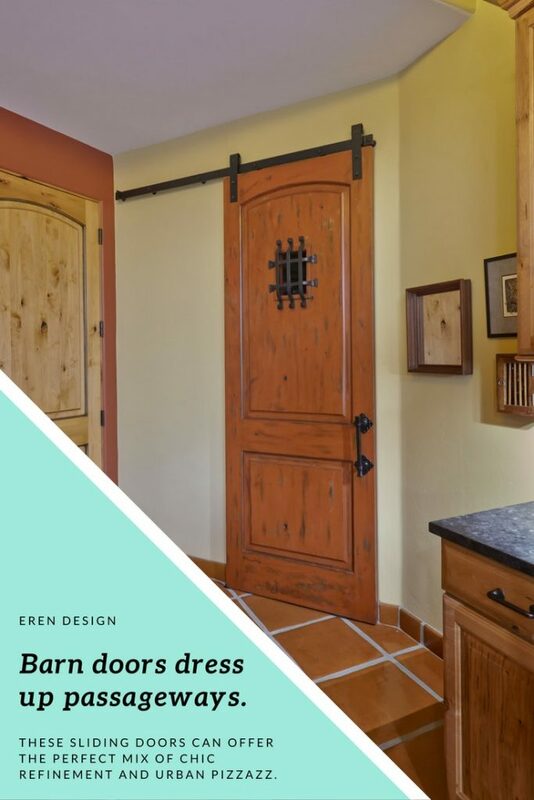 Today, barn doors are one of the most sought-after home design features. Whether you’re looking for an attention-grabbing entry or a space-saving solution, these sliding doors can offer the perfect mix of chic refinement and urban pizzazz. When you think of a barn door, what do you imagine? Do you see a red painted monstrosity? Do you picture rough, worn wood slats? Do you envision a clapboard-esc slider? Barn doors can be all of these things and more! Because today’s barn doors come in a wide variety of styles and colors. Sometimes we install reclaimed barn doors. In other instances, help homeowner’s select a custom-made barn door created to fit their home’s unique space and style. That’s the great thing about adding a barn door to your home. It doesn’t have to be one classic look. It can be designed to fit the décor of your Tucson home. What Makes a Barn Door? A barn door is any large, sturdy divider that runs from the floor to just above its given entryway. Hung from a long rail system mounted on the wall just above an entryway, barn doors slide forward and backward to cover or uncover a passage to another space. Is a Barn Door Right for Your Home? It really depends. Barn doors can add a lot of character to your space. And, they can give you some functional options that other doors can’t. But, they also have their own limitations. Ask yourself these five questions to decide if a barn door offers the right solution for you. 1. Is there enough structural stability to handle a barn door? This is the very first question to consider. 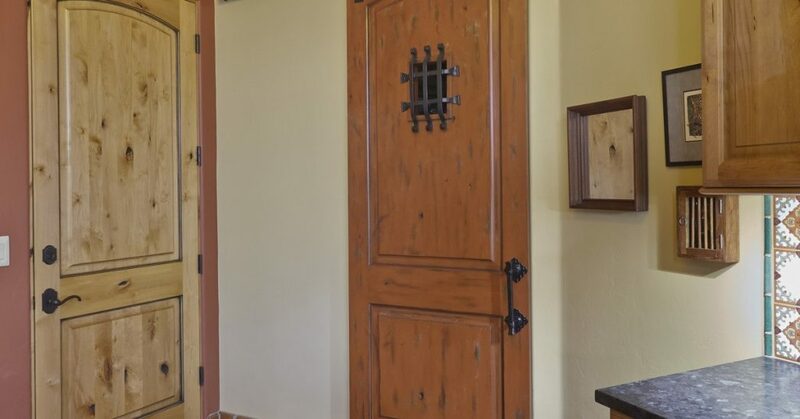 Look at the entryway where you want to place a barn door. Is the wall sturdy enough to handle it? Both barn doors and the rails on which they are mounted are typically heavy. The wall needs to be able to not only support the weight, but support the weight as it moves. 2. Will a barn door provide enough privacy? By their nature, barn doors don’t seal completely. This can allow everything (including smells and sounds) to slip between the two spaces the doors are intended to divide. Will this be acceptable for where you plan to place them? You might be okay with less privacy dividing your master bathroom from your master bedroom. But, the powder room in the hallway off the dining room might be another story. Or, you might have an entertainment room that you want to double as a guest bedroom. Will a barn door provide you and your guests enough privacy at night or when they’re changing? 3. Does the door need to lock? In many ways this falls in the ‘privacy’ category. Consider if the door needs to lock securely. If so, a barn door might not be for you. In most instances, locks on barn-style doors do not offer the same level of security as traditional doors that swing open and close. 4. Do you have enough wall space for a barn door? While a barn door does eliminate the space needed for a door to swing open, they do need enough wall space to slide. And, that wall space often has to be unadorned. It’s a very thin picture frame that could fit between the wall and your barn door! 5. What look do you want? As we talked about above, barn doors come in a wide variety of styles. You can get one that looks rustic. You could get a barn-style door that’s made of stainless steal for an ultra modern vibe. If you have grandkids visiting often, you might get a barn door with a chalkboard attached for instant entertainment. The key is to think about what style you want and how that will fit with the theme of your home. Let’s talk about a how barn door would look in your new home remodel!